Note: This article first appeared on ESPN.com’s SweetSpot blog today. When the Tigers traded Scott Sizemore to the A’s over Memorial Day Weekend, it brought an abrupt and mildly startling end to his tenure as Detroit’s second baseman of the future. The Tigers, after all, anointed him as the heir apparent to Placido Polanco almost immediately after they lost Game 163 to the Twins in 2009. Polanco was eligible for arbitration, which coincided with the Tigers’ momentary spending freeze, and soon he was back with the Phillies doing everything fans in Detroit had come accustomed to: steadiness in the field, reliability at the plate. But back to Sizemore. The Tigers sent him to the Arizona Fall League – “a graduate school” for top prospects, according to the AFL Media Guide – in 2007 and again in ‘09 in what they undoubtedly expected to be a final tuneup before handing over the keys to second base to him for the foreseeable future. Within days of the 2009 AFL season, Sizemore’s ankle was broken as he attempted to turn a double play and his fall league experience went kaput. It didn’t stop the Tigers from hoping that he could recover in time for spring training. Fast forward to May 27 when he was dealt to Oakland for David Purcey (himself an AFL graduate) and the book was closed on Sizemore’s career in Detroit: 65 games, a .223 average, .605 OPS and a mere three home runs. Not legendary stuff and certainly nowhere close to Polanco’s track record. Sizemore’s flameout got me thinking about the poor results the Tigers have seen from their Arizona Fall League representatives, particularly when contrasted with Central-division rivals. Over the past five years, the players sent by the Tigers to the AFL (including Sizemore, twice) haven’t lived up their billing. Tigers fans heard breathless projections of guys such as Brent Clevlen, Cameron Maybin and Virgil Vasquez — not to mention Jeff Larish and Cale Iorg — only to see them cut loose or traded or otherwise vanish from baseball. In some cases, Cody Ross and Burke Badenhop for example, Tigers AFL prospects have gone elsewhere and had success. outside of Granderson, which Tigers player and AFL alum over the past five seasons has the most big-league experience? Outfielder Casper Wells, who, at the All-Star break, had 97 games with the Tigers. Next in line is Opening Day second baseman Will Rhymes (73), Sizemore (65) and pitcher Eddie Bonine (62). Where are they today? 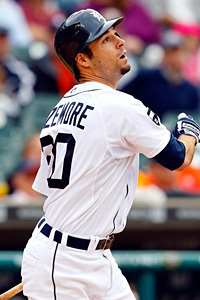 Rhymes is a Triple-A All Star in Toledo, Sizemore’s near the Bay and Bonine is pitching for the Phillies’ Triple-A club. From the perspective of a Tigers fan, these under-performing prospects are that much more frustrating when the Indians, White Sox, Royals and Twins accelerate their AFL players from the desert to the big-league club. How’s this for a collection of who’s who? Chris Getz. Gordon Beckham. Joe Crede. Alex Gordon. Eric Hosmer. Billy Butler. Mitch Maier. Joe Mauer. Grady Sizemore. David Huff. This examination of the Tigers’ AFL classes doesn’t mean they franchise hasn’t developed important players. Since 2006, Justin Verlander, Brennan Boesch, Alex Avila, Joel Zumaya all came through the Detroit farm system – but they bypassed Arizona on their way up. For many teams, particularly those in the A.L. Central, the Arizona Fall League has been a key stop on their development fast track. Unfortunately, for the Tigers and their top prospects this graduate school has handed out nothing but failing grades of late.